Did you know that fava beans, also known as the broad bean, faba bean, field bean, bell bean, or tic bean, are among the most ancient plants in cultivation? Favas are native to North Africa, southwest and south Asia, and are believed to have become part of the eastern Mediterranean diet around 6000 BC or earlier. That’s a long time ago. They must be doing something right. It’s a shame we don’t see them more often in restaurants, cookbooks, and in the markets and grocery stores. They add a wonderful bright earthiness to this quinoa salad – an adaptation on Hugh Fearnley-Whittingstall’s – and a great pop of colour alongside the summer squashes and toasted pine nuts. With a hit of lemon juice, you’ve got a light and lovely lunch salad or side dish. Place a large frying pan over a medium heat, add the oil and heat. Add the summer squash, onions, thyme and salt and pepper. Cook for 20 to 25 minutes, stirring from time to time, until the zucchini and tender and starting to turn golden. Add the garlic and fry for another couple of minutes. While the summer squash is cooking, shell the fava beans, bending the tip of the pod and pulling down the seam of the pod to “unzip” the pod and reveal the beans inside. Discard the fuzzy outer pod. Place the shelled beans in boiling salted water for 5 minutes. Remove and place into ice water. Peel off the beans’ thick waxy outer covering. Set aside. Rinse the quinoa in several changes of cold water and then place in a saucepan along with 2 cups of cold water and a pinch of salt. Bring to the boil and then reduce the heat and simmer until the quinoa is tender and the long white kernels are coming away from the seeds. Tip into a sieve and leave to drain and steam. 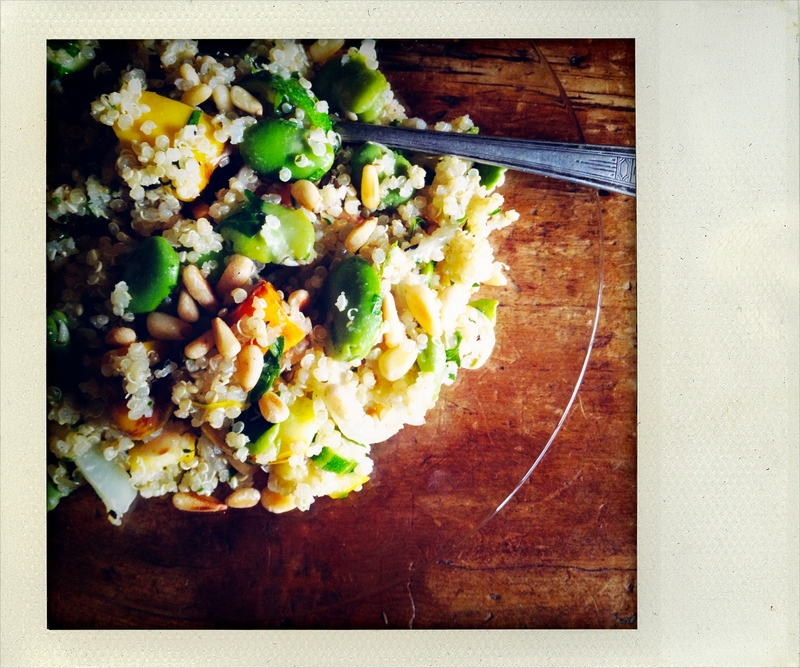 Combine the quinoa, fava beans, summer squash, and onions and toss to mix well. Add the parsley, lemon juice, salt and pepper and stir well. Check the seasoning and adjust as necessary. Serve topped with toasted pine nuts.